There were two major battles fought by the Marne River near Paris, France. This article discusses the first battle fought in 1914 between September 5th and the 12th. 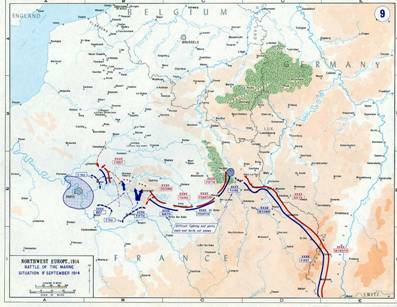 The Second Battle of the Marne was fought four years later in 1918 between July 15th and August 6th. Who fought in the First Battle of the Marne? The First Battle of the Marne was fought between Germany and the allies of France and Britain. There were over 1,400,000 German soldiers under the leadership of General Helmuth von Moltke. The French and British had just over 1,000,000 soldiers including six French armies and one British army. The French were led by General Joseph Joffre and the British by General John French. World War I had begun about one month before the battle. During that time, Germany had been steadily gaining ground and winning the majority of the battles. They had advanced through Belgium and were marching through France. The speed of the German attack was all part of a war strategy called the Schlieffen Plan. Germany hoped to conquer France and Western Europe before the Russians could muster their army and attack from the east. This way Germany would only have to fight at war on one front at a time. As the Germans approached Paris, the Allies of Britain and France decided to give an all out effort to stop the advance of the Germany army. This fight became known as the First Battle of the Marne. It was French General Joseph Joffre who decided that it was time for the Allies to counterattack the Germans. At first, British leader Sir John French said his men were too tired from the retreat to attack. However, British war minister, Lord Kitchener, convinced him to join with General Joffre in the attack. As the Germans advanced, their armies became strung out and a large gap grew between the First and Second German armies. The Allies took advantage of this gap and charged between the two armies splitting the German forces. Then they attacked from all sides confusing the Germans. After a few days of fighting, the Germans were forced to retreat. They retreated back to Aisne River in northern France. Here they built long lines of trenches and managed to hold off the Allied army. They would hold this position for the next four years. The armies on both sides of the First Battle of the Marne suffered heavy casualties. The Allies had around 263,000 soldiers wounded including 81,000 that died. Around 220,000 Germans were injured or killed. The battle was considered a major victory, however, for the Allies. By holding off the German army, they had forced Germany to fight the war on two fronts. As the Russians began to attack from the east, German forces had to be diverted to the east while still trying to hold off the French and the British in the west. The French used taxis in Paris to help move troops quickly around the battlefield. These taxis became known as the "taxis of the Marne" and became a symbol of France's will to win the war. This was the first major battle where reconnaissance planes were used to discover enemy military positions. This played a key role in helping the allies position troops and win the battle. The German forces were exhausted by the time they reached Paris. Some of the soldiers had marched over 150 miles. More than two million soldiers fought in the battle with over half a million wounded or killed.